I have talked before about my white wolf project (see AP 23 March), and these images are often referred to when discussing my career. This isn’t a comment about me, but more about the importance of the period and the project it produced. 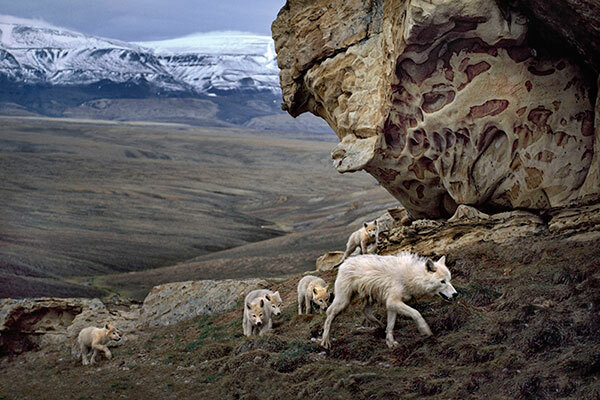 I took the wolf photographs over three years while on assignment for National Geographic in the high Arctic, specifically on Ellesmere Island, which is the top island in the Qikiqtaaluk Region of the Canadian territory of Nunavut. It’s just before the North Pole. I was in the region covering a dog-sled trip. If I’m honest, the whole trip for me was a bit of a ruse – a chance to get close to the white wolves I knew lived in the area. I knew there was a pack there that had little fear of man and had never been photographed. During the sledding assignment I spent much of my off time looking for this pack of wolves. You can just about see the den, which is the big rock with the overhang to the right. I managed to find it one day while tracking the wolves. In all likelihood, that den has been use for centuries. I actually went inside the den once with a BBC film crew and took some photographs. The mother wolf stood outside. Obviously she was a little unhappy about us being there, but she wasn’t especially upset. The group were used to my presence by then as I was often around the den.This picture, taken in my first year there, is by no means my best, but it sums up the situation I was in. Although you can’t see it in the image, our camp was right in the centre and less than a mile away from this group’s den so I lived very close to them. To give you an idea of how fearless this pack was, when our team would go out for the day the pack would actually break into our camp, steal food, and tear up tents and sleeping bags. We had to do all kinds of unusual things to keep them away. One day we erected stone monuments around our camp. Then I had the bright idea to urinate on them because I thought it would act as a territorial signpost. It didn’t really help. The adult wolf you see at the front is one of the babysitters. I called it Scruffy. On this day the rest of the pack was away hunting, and sometimes the group would be off for a day or two. Scruffy was very put-upon by the rest of the pack. Every other adult picked on him, but when the pack went hunting Scruffy was the dominant individual. He’d then display the same behaviour towards the puppies that the adults did to him. Photographically, everything on this trip was shot using Kodachrome film. We had so much light there it was an ideal film to use in my Nikon camera. I was actually shooting moving images on 16mm as well as trying to produce a series of stills. It was bordering on insanity. These days, of course, it wouldn’t be quite so hard. I can only imagine what I’d have done with a digital camera and often think of the moments I may have missed. I was incredibly close to the pack in this shot, although I was often even closer than this when shooting with a wideangle lens, such as a 20mm. Sometimes I’d get so close the puppies would run up and start chewing my laces. The closest I ever came to an adult wolf was around 1m (3ft). I’d say I shot this image with a 70-200mm zoom lens, probably in the 70-100mm range. I don’t think the lens is pulled all the way out. Leaving these wolves was truly traumatic. I was there in 1988 and I haven’t been back. These days it’s virtually impossible due to the astronomical costs of travelling. National Geographic spent a fortune sending me there, but now I can’t imagine any magazine sending a photographer to the area. When I left I felt distraught. There was a small landing strip and when I looked through the plane window during take-off I saw the pack sitting alongside the runway watching us. It was incredibly poignant – they’d became a kind of surrogate family for me. Right from the outset of the assignment I knew I was lucky to have found the wolves and be able to learn about them. I knew it was an experience never to be repeated. However, this image is important to me for another reason: it’s a shot that was taken in an environment undergoing serious changes. The weather in the high Arctic is very changeable, and it can obviously get incredibly cold, but climate change has altered the whole ecosystem. It means that the numbers of animals that live there are depleting rapidly and that includes the wolf population. Their numbers aren’t threatened, but they’re definitely down. The weather has become warmer and, as a result, instead of snowing it’s now become some sort of freezing rain. That turns the ground into ice, meaning that the animals can’t get to the food. The Arctic is going to be the place where we’ll see the most extreme changes. It’s heartbreaking.